Don't be offended when I say you weren't as bad as we thought Texas State. You did better than we expected Texas State. 6-6 is nothing to sneeze at, though why anyone would sneeze "at" anything is beyond the Bud's comprehension. We digress. Let's open up the Bobcats 2013 season and see what's inside. 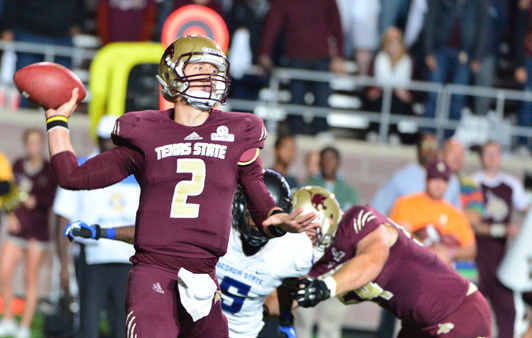 Texas State made the jump from FCS to WAC to Sun Belt in two seasons. The Belt wasn't entirely hospitable to State most weekends but nevertheless coach Fran and co. fared as well as could be expected, beating the bottom feeders and getting popped by the conference's upper echelon. Texas State actually played Tech close for a little over a half before falling apart big time to the Red Raiders. The 'Cats should be encouraged by wins over Wyoming and 6-win South Alabama. Let's temper that with a look at how TSU finished 2013, getting drilled in 3 straight by Arky State, Western Kentucky, and Troy. Baby steps Bobats. Baby steps. Tyler Jones might have a little something, something. Let's not go calling him Tyler Football or anything, but the freshman from Stephenville might be the answer at quarterback for the Bobcats. He completed 62% of his passes with 8 TDs and 5 Ints. Throw downfield Tyler, someone has to, no matter what Fran tells you. Robert Lowe might also have a little something, something. Lowe is just a sophomore from the planned home of the super collider, Waxahachie. Look it up kids. Don't look up Robert Lowe's stats, we got'em right here. Lowe averaged almost 6 yards a pop in the run happy Bobcat offense. He was effective enough to get a second team All-Sun Belt patch for his letter jacket, we're assuming letter jackets are still an item. Defensively, the 'Cats weren't terrible. Granted this isn't the most encouraging headline but it bodes well for the future. The Bobcats finished 58th in total defense and top 3 in the conference. All that and they return most of their talent for 2014. Keep an eye on linebackers Michael Orakpo and David Mayo. They'll be back and presumably better. The big boys beat up the Bobcats. There is a statistical shift between Texas State's defensive output against good teams and bad teams. Make that a statistical chasm. The Bobcat defense allowed almost 2 more yards per rush against winning FBS squads. Conference opponents completed passes at an 11% higher clip against the Bobcat D. Want more? Probably not, but chew on this, against FBS winning programs the Bobcats allowed 39 points a game. Against non-winning FBS teams that number dropped to 24 points. They put the Uh-Oh in Offense. The Sun Belt is an offensive league. Think the WAC but, you know, solvent. Texas State is in the stone age of the offensive arms race in the league. That means that your defense had better be the '85 Bears. They aren't. 2013 showed the 'Cats that they need score in order to compete in the Belt. After the transition from FCS to the WAC the first thing apparent was the lack of FBS talent and size on the roster in San Marcos. Fran and his staff have worked hard make up ground in that area. Trystan Mizerak. The Meat Hook. Deep down and not so deep down Coach Fran wants to maul people. He's working on accumulating the beef to do so. The Bud loves Trystan Mizerak a mammoth guard from Garland. Might be a good idea to find some size inside on the defensive line. But then everyone is looking for those guys. The Bud like Frankie Griffin, a safety from Klein Collins who at this point has chosen the Bobcats over Iowa State, Utah, and Colorado State. The Bobcats take on Arkansas Pine Bluff to kick off 2014. Let's go ahead and pencil in a W there. Navy comes to town next and then a couple roadies to Illinois and Tulsa. If Texas State can win one of those three, say Navy or at Tulsa, that's a great start. As far as the conference slate goes Texas State gets a favorable schedule, missing Troy and road trips to Las Cruces, South Alabama, Georgia State and ULM. They welcome Arkansas State, Louisiana Lafayette, Georgia Southern, and Idaho to San Marcos. Posted on January 3, 2014 by Sure Bud and filed under Southwest Round-Up, Sports and tagged Post-Mortem Texas State Bobcats.